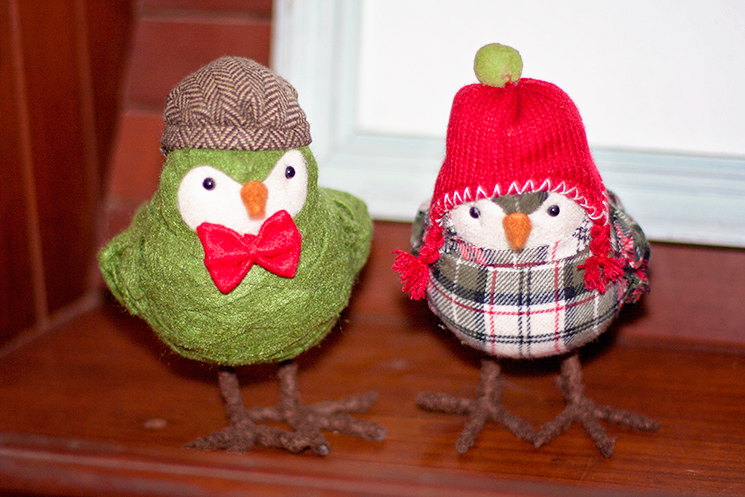 I love the holidays, particularly decorating for them and listening to holiday music (Christina Aguilera holiday album anyone? No? Guess I am on my own there) or watching Christmas movies. 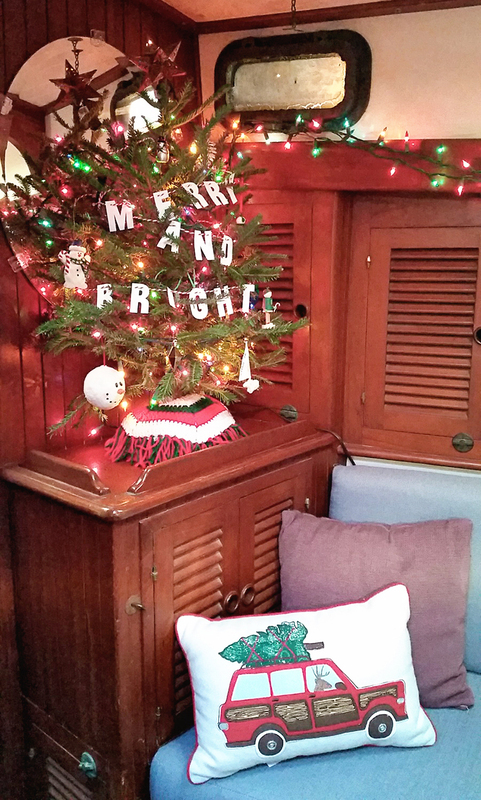 With all the tiny living that comes with life aboard, we’ve had to adjust our decorations to an appropriate scale. No more giant trees and stockings over the fire place. Instead, we picked up the smallest tree that Home Depot had on display while we were there picking up a bolt for our rudder post project. We named him Jack, short for Jack Sparrow. I successfully avoided creating a Pinterest Fail, and fit about 5 of my ornaments that weren’t either too big or too heavy on the tree. Atop of the tree this year, we used the Moravian tin star that we got at my friend Holly’s Mexican wedding. It fit perfectly. I’ve honestly been searching for years for the perfect tree topper without any real luck. This guy has meaning to us. 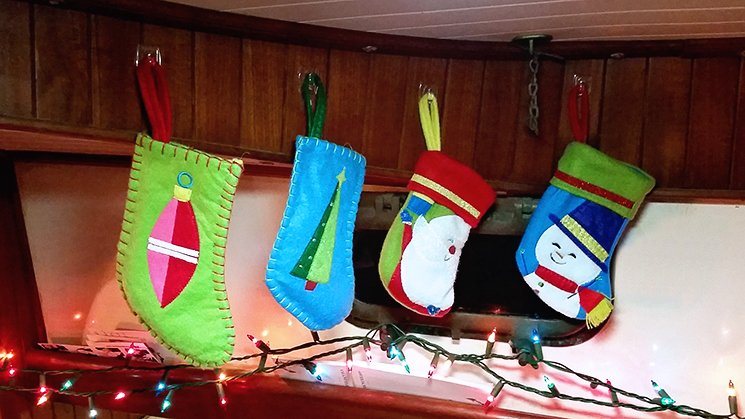 Back when we were living on Chance I picked up a few tiny stockings that have are the perfect size for the boat, and are now nestled up above the nav station. We also have a few holiday mugs and I found this adorable NYC holiday tea towel that reminds me of when I lived in Brooklyn. Ah, memories. 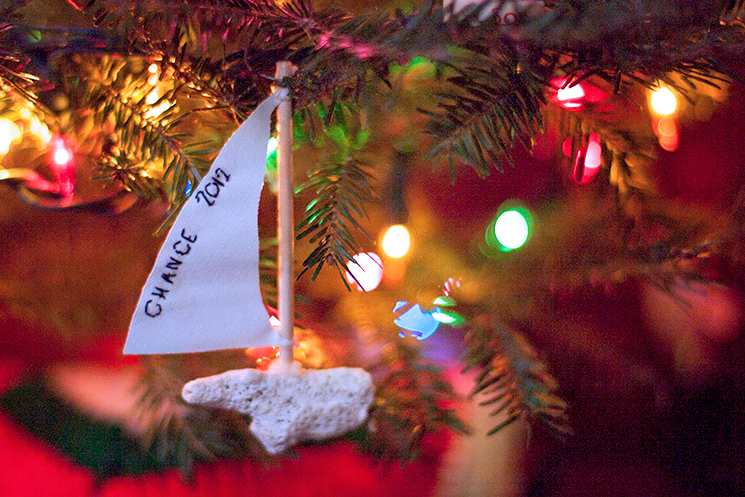 I made this ornament for Jason just after we quite our jobs and headed down to Florida. We had no idea what was in store for us, but we took a chance (hence, her name). So glad we did. Clearly Jason is the one in the bow tie. 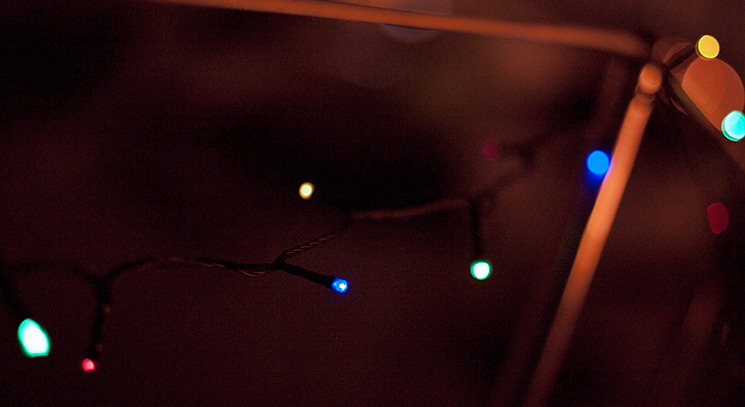 For the outside we ordered two strands of photosensitive solar LED lights that seem to be doing an OK job. They charge up all day long, and as soon as the sun goes down, they pop on automatically. The best part is that they use absolutely zero electricity! The only thing I don’t really like about them is that they are pretty small bulbs so they aren’t very impactful at any distance. These guys are going to be really nice in the cockpit when we’re out at anchor this summer though as they provide just enough mood lighting. In addition to our decorations, about five or six other boats just on our dock alone have put up a tree or strung up lights outside. It’s so magical. 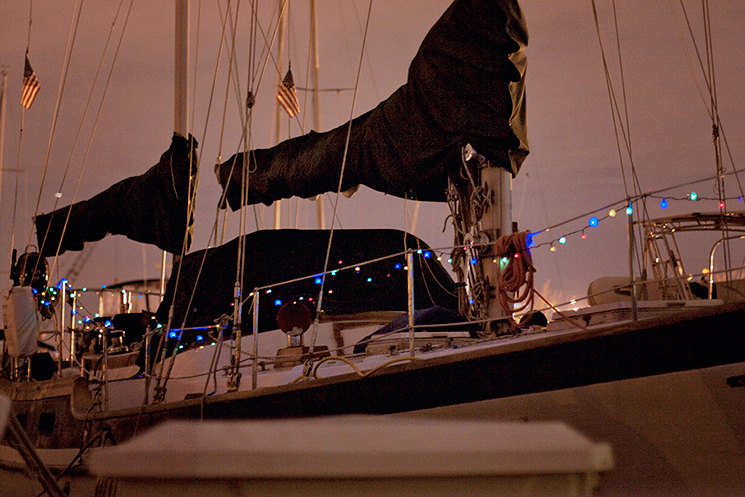 Each dock has a handful of boats that are decked out with strands of lights going up and down the mast. It really makes the marina feel like a neighborhood. Walking home from the ferry each night puts a smile on my face. I really love this time of year! This year we just hung the lights from the lifelines, maybe next year we’ll hang them up and down the masts! For the record, I am very PRO Christina at Christmas and during all times of the year.